1 Fire Commissioner: 5-year term. 1 Fire Commissioner: 3-year term. 1 Fire Commissioner: 2-year term. You must be legal voting age. A resident of the Westford fire District. NO Later Than November 21st 2018. You must be registered to vote in the Westford, NY fire district no later than November 19, 2018. ** IF THESE HOURS ARE INCONVENIENT FOR YOU PLEASE CONTACT ME AND WE CAN ARRANGE A TIME THAT IS BETTER FOR YOU!! Please Note: In 2013, a Local Law was passed that ALL Town of Westford Residents (tax payers & rentees) MUST have a Town authorized permit to dispose of garbage. Permits are free to Town Residents and available at the Town Clerk's office. Proof of residency (tax bill, utility bill, etc. - with your physical address (not mailing address) is required. Non-Residents may use the facility at a fee of $3.00 per bag. 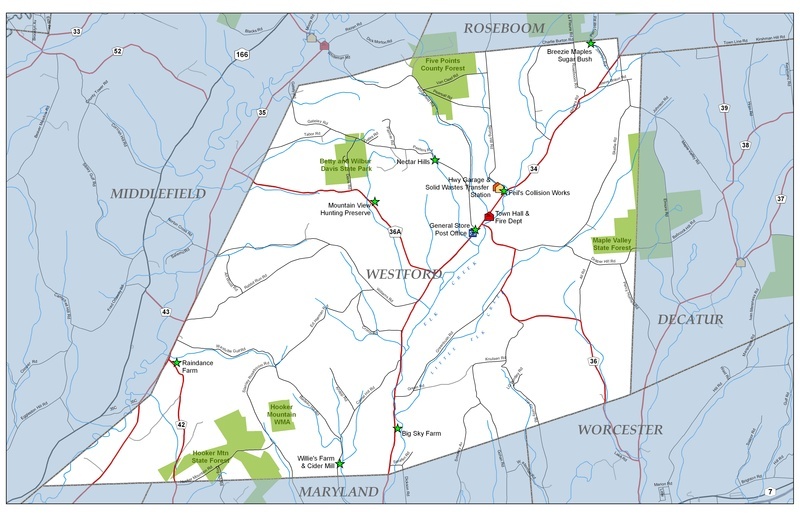 Click on the Documents banner above to view the Town of Westford Local Laws. ALL dogs MUST be licensed. Click on the Documents banner above for a description of the DOG CONTROL LAW or click on the Town Clerk/Tax Collector banner and scroll to ISSUANCE OF DOG LICENSES for instructions to license your pet. Click Here to go to the 2018 Town Budget. E-Payment Service available at Town Clerk/Tax Collector Office. Tax Payments = $3.95 flat Visa Debit Card fee. 2.45% (or $3.95 minimum) Credit Card fee. Non-Tax Payments (i.e. Dog License, Marriage License, Hunting & Fishing License, etc.) = 2.45% (or $1.75 minimum) Debit & Credit Card fee. 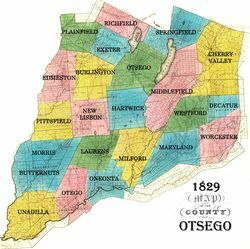 Westford is located in the foothills of the Catskill Mountains, in the eastern portion of Otsego County. The nestled in the rolling hills is a community of agricultural enterprises, small hamlets, scattered rural residences, and a variety of small and home-based businesses. The Town has a strong agricultural tradition. Modern dairy farms, organic beef and vegetable farms, and sugar maple farms continue that tradition. These enterprises contribute greatly to the town's rural character and open spaces. DO YOU KNOW HOW MANY BUSINESSES THERE ARE IN THE TOWN OF WESTFORD? Some of them can be found by clicking on the "links" banner above. According to the latest Census, Westford is home to approximately 870 people. Westford enjoys one of the fastest growth rates in the county, with a population increase of nearly 100% since 1970 when the population was 435. The population centers are the hamlets of Westford, in the center of town, and Westville, on the western boundary with the Town of Middlefield. The Town has three active churches, the Methodist Church and Episcopal Church located in the hamlet of Westford and the Methodist Church in the hamlet of Westville. The Town Hall and Westford Methodist Church serve as community centers for various activities. Most of the children in Westford attend Schenevus Central School in the neighboring Town of Maryland. Some of the children also attend neighboring Worcester, Milford and Cherry Valley schools. The Westford Community Association provides opportunties for social events and activities for children. These events include the Westford Christmas Pageant, the Easter Egg Hunt, and the Halloween Costume Party. The Association also hosts the Alumni luncheon for former graduates of the Westford School. The Town Hall and Fire Department is located at 1812 County Highway 34 in the old Westford school. The Town Hall serves as the meeting place for several local organizations, including the Planning Board, the Westford Community Association, Fire Department and it's Auxiliary. Town Clerk Office and Town Court are also in the Town Hall. The Westford Post Office is located in the center of the hamlet at 1743 County Highway 34. The Lobby is opened for access to mail boxes Monday thru Friday 8:00 a.m. - 5:30 p.m. and Saturday 8 a.m. - 11:45 a.m.. Window service is available Monday thru Friday 9 a.m. to 1 p.m. and Saturday 8 a.m. to 11:45 a.m. Families enjoy recreation at Gopher Field, Busacher Park and Wilbur and Betty Davis State Park. Gopher Field includes a youth soccer field and Little League field. Busacher Park boasts a pavillion avalable for picnics located next to the Town Hall/Fire Department. The State Park includes hiking trails, catch and release fishing, a playground, and events pavilion. Six lovely log cabins are available for lodging at the State Park. Many of our agricultural enterprises are either open to the public or provide direct services to the public, for instance: .............Breezie Maples is the largest organic maple syrup producer in the state of New York. Breezie Maples won the Cooking Light 2010 Taste Test Award. In the Spring, visit Breezie Maples on their open house day to tour the facility, taste the syrup and take home a bit of Westford! .............Nectar Hills, Big Sky Farm and Raindance Farm produce quality organic meats and vegetables available through community supported agriculture programs and/or local farmer's markets. Nectar Hills also has a store in nearby Cherry Valley. ............Willie's Farm and Cider Mill is open seasonally in the Autumn, feature custom cider pressing, local crafts, baked goods, special events and lots of fun activities for families including wagon rides and a corn maze. ............Mountain View Hunting Preserve offers (fair chase) bird hunts including stock Pheasant, Chukar, Hungarian Partridge and Quail, 7 days a week from September 1st to April 15th.